Welcome to Saturday Nite Special #130, the multi themed DIY link party! One of my very favorite things in the world is to see what others do with furniture in a new way. 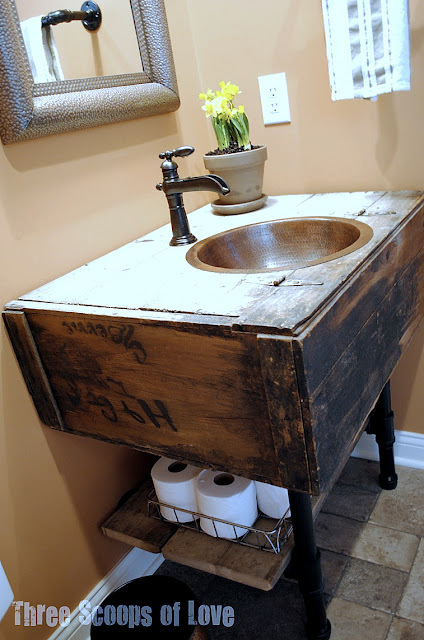 I totally fell in love when I first spotted this wall cabinet turned crate styled sink. It’s just so well done! The hinges left on the surface, uneven painted finish, pipe legs, rustic graphics, and cool reclaimed wooden shelf make this little number tops in my book. I want one! 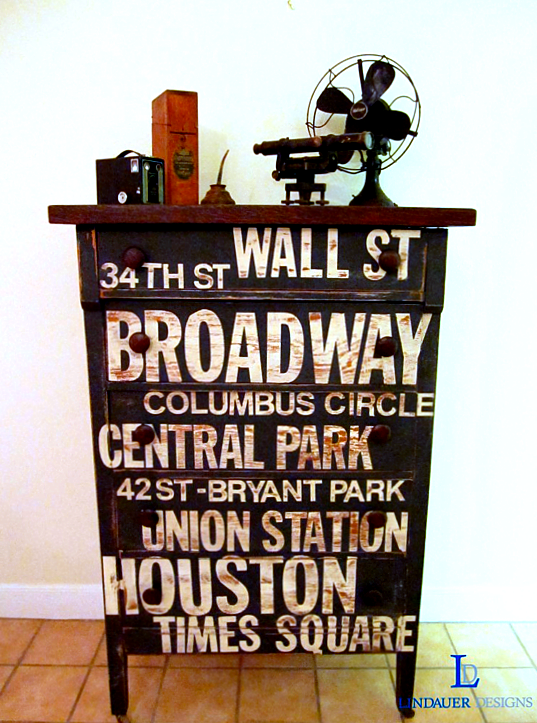 This fabulous subway styled dresser is drop dead gorgeous. 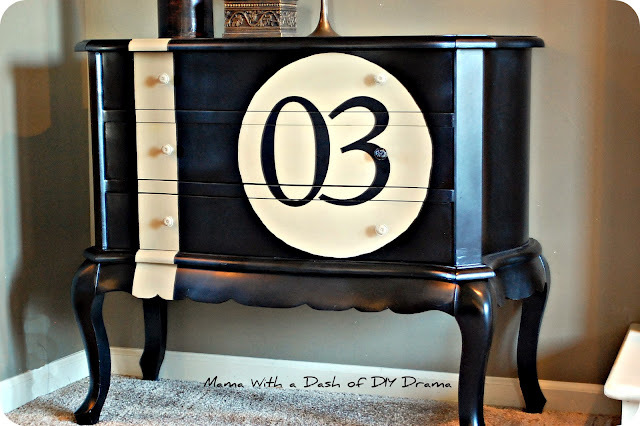 I love the boxy lines on this dresser as well, which has a true ‘made out of a sign’ feeling to it. Smart black against white… nothing like it. This adorable racecar dresser is a creative way to bring a theme into a room. The black and cream really kick up that sophistication a few notches. Vrooomin’ awesome! 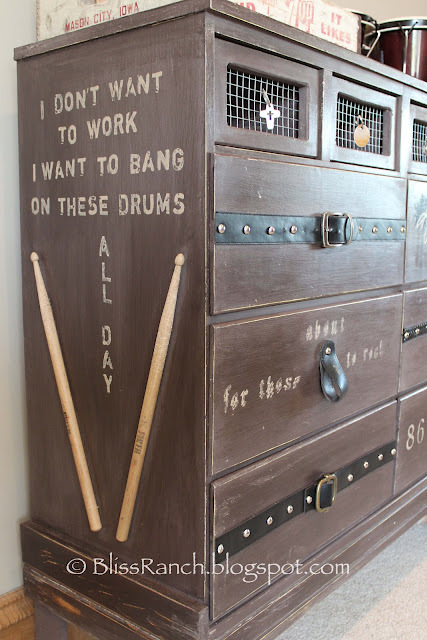 What rock and roll kiddo wouldn’t love a dresser decked out to the tune of his favorite music? Belts, buckles, and more create a one of a kind element in this bedroom. Love the colour and the added wire mesh to the drawers. I’m a VERY big fan of Jane’s work. 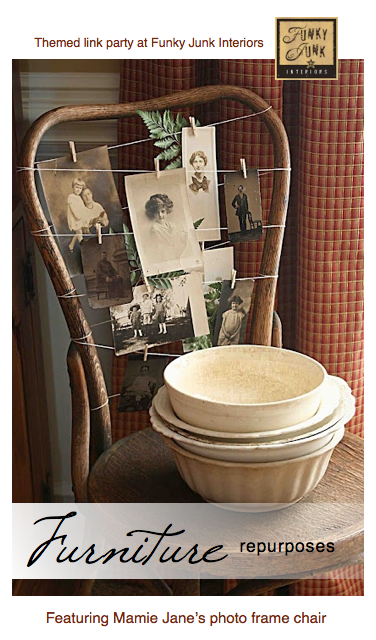 I shouldn’t be surprised when I find something I love on her blog but this broken chair turned photo gallery made me gasp! Stunningly gorgeous and so simple to do. Are you a furniture repurposer? 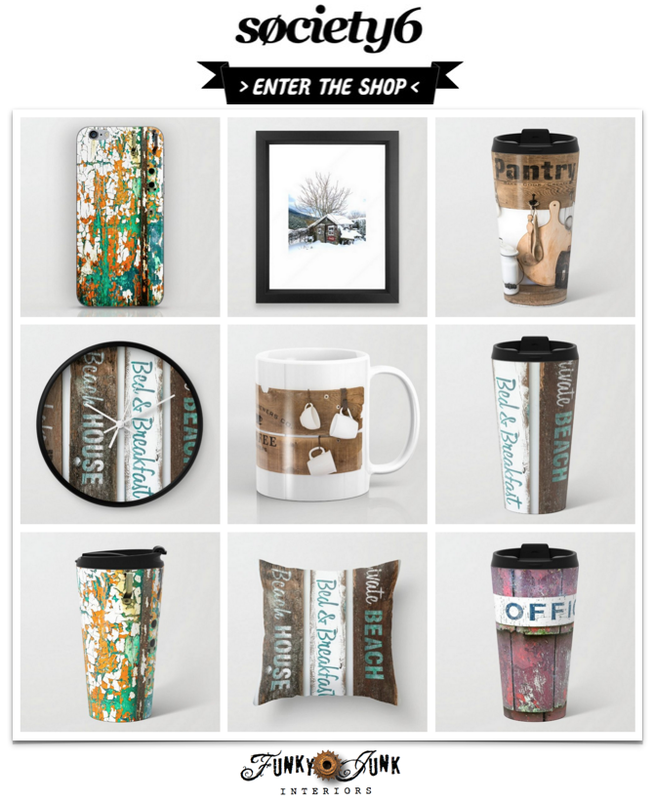 Show us whatcha got in this weekend’s 3rd themed linkup! Sorry the party was late, gang. I had it scheduled correctly but it didn’t roll. No idea why. Thanks for the party Donna! My repurposed furniture is actually 2 pieces of furniture that I married for a really cool craft/ sewing center. No worries at all! I love your blog…You always inspire me to keep trying new things! Thanks for hosting this party each week, too! Lots of fun projects to check out already! Hey Donna! I looove the theme tonight!! Thanks for giving us a chance to share our projects! Thanks for hosting Donna. Always glad to have something to share. 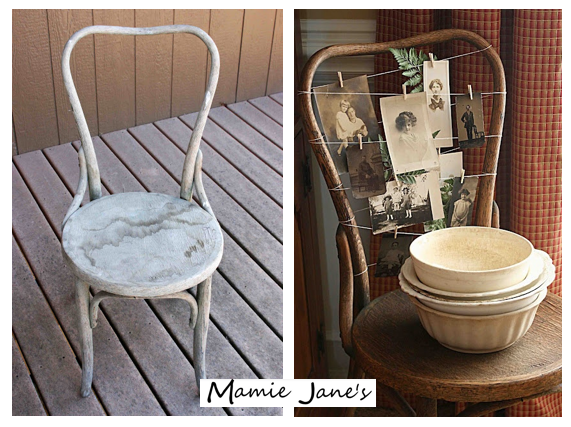 This week I tried a copy cat from Mamie Jane and I love the result – old metal shop files and magnets as photo holders (51). Thanks for hosting Donna. This was a good week for making new garden beds and transplanting. Glad I had something to add. The furniture you featured is really neat. I love the rock n roll dresser so much. Thanks for hosting Donna! Hope you have a wonderful weekend. I am sharing a DIY Baby wipes http://practical-stewardship.com/2012/03/02/diy-cloth-baby-wipes-or-washcloths/ Thanks so much for hosting! 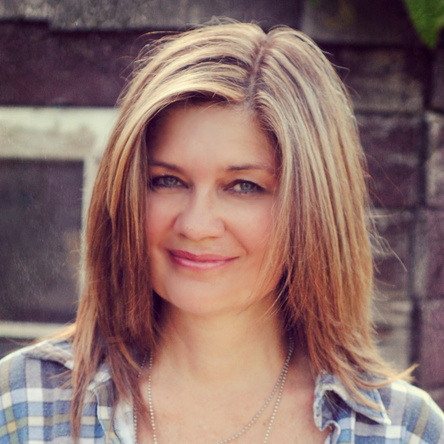 Thanks Donna for hosting…it’s always fun to join in:) Jane is one talented gal!!! Great features. Thank you for hosting the party. Thanks Donna! Enjoying my coffee and perusing all the great talent out there! I love the furniture you chose as examples, especially the sink. I couldn’t wait up for your party, too tired, so had to join it in the morning! I have read that others have had the same problem with a scheduled post not posting. Thanks for the party Donna! Have a fabulous weekend!! Thank you for hosting!!! Have a fab weekend! Donna, that Jane has some of the most amazing ideas. Her wheels are turning all the time. projects. Love the vanity,cool. Hope you and Cody have a wonderful weekend. 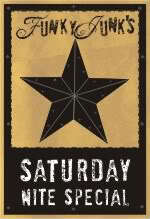 Thanks for hosting – I always count down the days till this! Thank you so much for the feature, I can’t express how much I appreciate it!! You know I love your SNS party and it has been way too long since I have linked a project. I’m hoping to get back to blogging soon and can’t wait to have something new to post to SNS. Take care. Love all of the features! They are fab and provide so much inspiration. Thanks for hosting and have a wonderful week! Thanks for giving us a fun place to link up every week! Donna – Can you recommend a stencil-cutting machine for those of us who don’t make signs for a living? 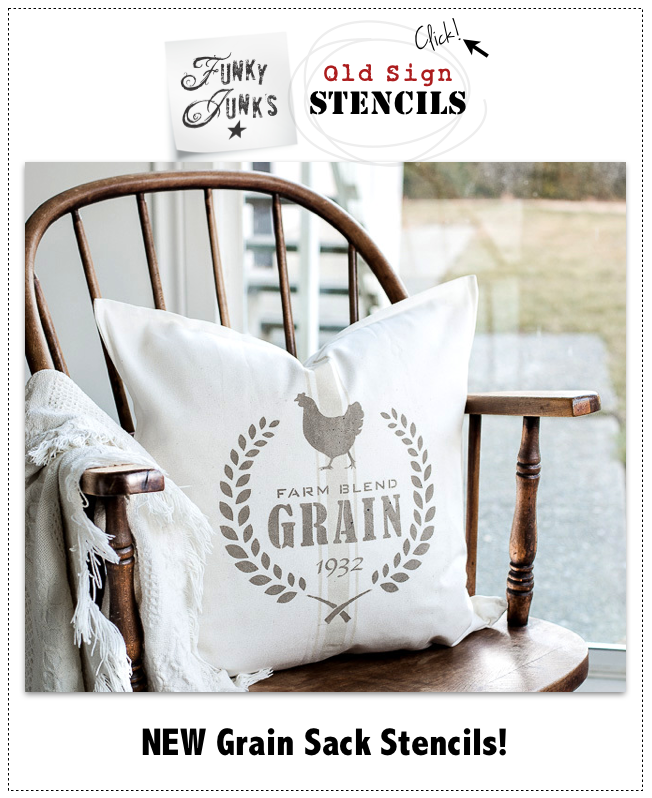 I LOVE all your typography details, but my hand just isn’t steady enough to cut my own stencils. OOOOOH! I am a little frustrated. . . Joined a bunch of link parties for the first time this weekend and JUST realized that most of the buttons I put on my page weren’t clicking through to anywhere! ALSO realized that the project I thought I put up here at Funky Junk – is nowhere to be found. Oh, learning curve! You taunt me! I THINK i am now #100 above. . . hopefully. Awesome place to hang out and gain all kinds of inspiration! I follow you on my blog. Donna, you have outdone yourself this week in your features. I have featured three of those as my all time favorite projects, but oh my, that bathroom sink redo just left me breathless. I pinned that and moved it to the top of my DIY list for my home. Thanks for sharing that one! Thank you for hosting this wonderful party. I’m getting so many great ideas! As long as you keep hosting Donna, I’ll try to link. Thank you for featuring my rock ‘n roll dresser. You rock too!